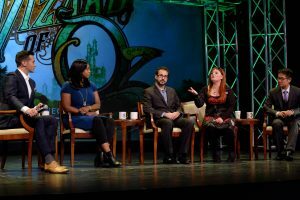 The summits are headlined by a panel discussion featuring top names from various areas of media, but the day also offers small-group discussions where students can listen to and ask questions of visiting luminaries. 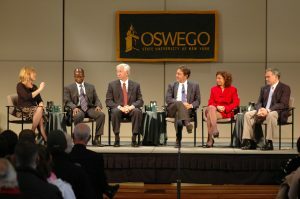 The panel included supervising producer for “The Lead with Jake Tapper” on CNN Kristen Donnelly; Radio host and conservative political commentator on WHAM-AM in Rochester, New York Bob Lonsberry; Deputy chief of staff and communications director for U.S. Rep. Elijah Cummings Trudy Perkins ’93; and CBS news radio correspondent Steven Portnoy. Co-anchor and helth and wellness reporter for NewsChannel 13 in Albany, New York Benita Zahn moderated. The panel included Composer-in-residence for the Los Angeles-based symbiosis ensemble and concert series, “Music @ MiMoDa” George “Nick” Gianopoulos ’07; Star of the Lifetime Television series “Pitch Slapped” Diana Preisler ’96; Director, actor, playwright, and visiting assistant professor at SUNY Oswego Mya Brown; and the communications manager for University Services at Princeton University Michael Yoon ’00. Co-host of FOX5 Las Vegas’s popular lifestyle and entertainment programs, “MORE” and “MORE Access” Sean McAllister ’01 moderated. The panel included ABC News national correspondent Kendis Gibson ’94; WSYR-TV Chief Meteorologist Dave Longley ’94; Vox.com Senior Editor Michelle Garcia ’06; and WSYR-TV News Anchor Jennifer Sanders. Student Association President Christopher Collins-McNeil ’16 moderated. 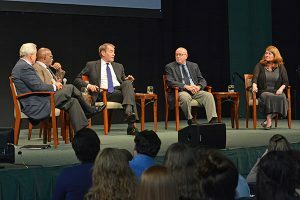 A pair of media icons — Charlie Rose and Al Roker — headlined the 10th annual Lewis B. O’Donnell Media Summit on October 16, in SUNY Oswego’s Marano Campus Center. Other participants included nationally syndicated Pulitzer Prize-winning columnist Connie Schultz and Dennis Thatcher, president and chief operating officer of Cleveland-based Mission Broadcasting. 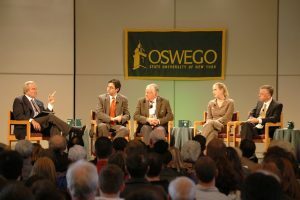 Panel moderator was Ken Auletta, a 1963 graduate of Oswego, columnist for The New Yorker magazine and best-selling author of books on the media industry. 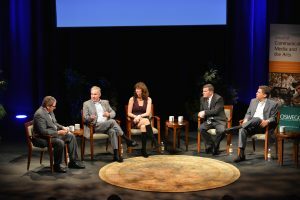 ESPN “SportsCenter” anchor Steve Levy and former World Wrestling Entertainment executive Donna Goldsmith headlined an all-star, all-alumni and accomplished panel of sports media and business professionals for the 2013 summit on November 6 in Tyler Hall’s Waterman Theatre. Other panelists for the sports-themed summit, titled “Get in the Game,” included Jay Beberman, managing editor for sports at Bloomberg News, and John Kucko, sports anchor at WROC-TV in Rochester. All of the panelists — Levy and Kucko in 1987, Goldsmith in ’82 and Beberman in ’89 — graduated from SUNY Oswego. 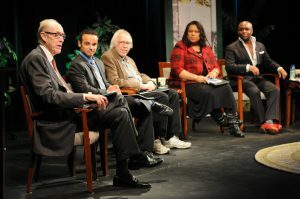 Former national news anchor Garrick Utley and political analyst Edward Wyckoff Williams were among the headliners for the Dr. Lewis B. O’Donnell Media Summit on Wednesday, Oct. 24, 2012 at SUNY Oswego. The summit title was “A Star Is Born”; the event took place at 3 pm in Tyler Hall’s Waterman Theatre. On the panel were Edward Wyckoff Williams, a columnist, political analyst and former investment banker who regularly appears on MSNBC, CBS and nationally syndicated radio; Kevin Torres, SUNY Oswego class of 2006 and a regional Emmy award-winning backpack journalist at KUSA-TV in Denver; Denis Mueller, an award-winning documentary filmmaker; and Jackie Robinson, recently retired WSTM-TV news anchor-Garrick Utley was the moderator for the 2012 summit. The panelists had a ninety minute discussion on today’s media landscape and the implications for anyone trying to break into the business. After the summit, students had a chance to meet one-on-one with the guests as well as a variety of Career Connectors and visiting professionals from around the area. 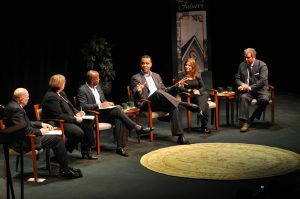 The 2011 edition of the Dr. Lewis B. O’Donnell Media Summit focused on “Diversify Yourself.” The 2011 theme was structured around Media Diversity. In particular, issues/questions pertaining to ethnicity, gender, technology, business models, content and global were addressed by the panel. 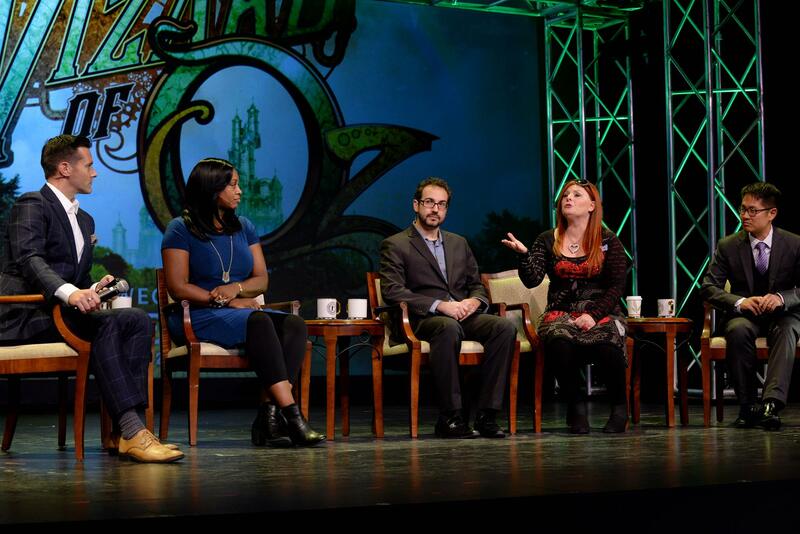 The activities for the day concluded with an all-star panel discussion at 3 pm on October 27 in the Waterman Theatre. Moderator for the 2011 Media Summit was Dr. Michael S. Ameigh, general manager of WRVO Public Media. The panelists for 2011 were Kendis Gibson ’94, now a reporter for ABC News; Ric Harris, sales leader/media strategist at Accenture; Sharon L. (Friedlander) Newman ’79 of ABC News Radio; Ms. Adriana Waterston of Horowitz Associates; and Louis A. Borrelli Jr. ’77, the founder and co-sponsor of the annual summit. 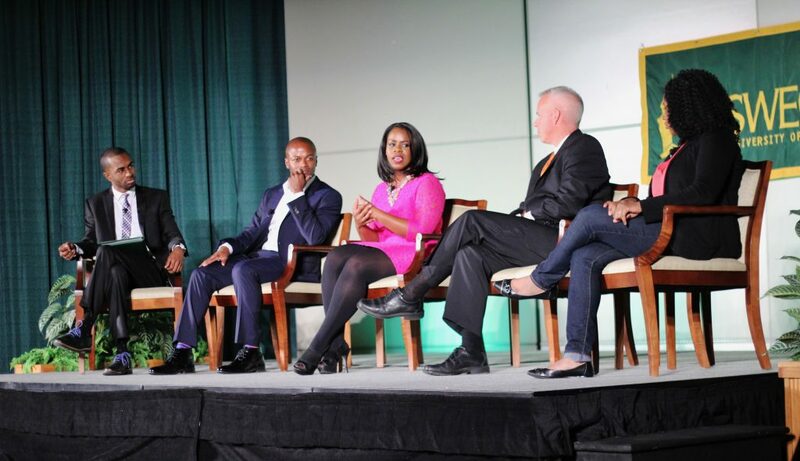 Left to Right: Dr. Michael S. Ameigh, Sharon L. (Friedlander) Newman, Kendis Gibson, Ric Harris, Adriana Waterston, Louis A. Borrelli Jr.
SUNY Oswego’s sixth annual Lewis B. O’Donnell Media Summit explored a new dimension-the rapidly heating, consumer-driven realm of 3D and personal devices. Panelists were Vicki Betihavas, television producer and founder of Nineteen Fifteen, a 3D high-definition TV production company based in the United Kingdom; Andy Carvin, senior social media strategist for NPR; Mike Cassidy, a 1998 Oswego alumnus who is founder and president of Undertone Networks; and Jon Landis, Ph.D., Northeast education development executive for Apple Computer. The panel discussion took place on Thursday, Oct. 14, 2010. 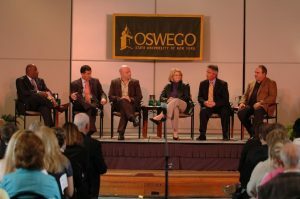 In addition, Oswego alumna and award-winning anchor Benita Zahn, of WNYT-TV in Albany, was the moderator for the 2010 Summit. The 2009 edition on Oct. 14 presented “Your GPS Directions to the Digital Media World.” The 3 pm panel in the Sheldon Hall ballroom included moderator Louis A. Borrelli Jr., former president and CEO of market leader NEP Broadcasting, the summit’s founding sponsor and a 1977 Oswego graduate; Matty de Castro, an account director at Facebook; 1988 Oswego graduate Mark Levy, vice president and creative director for NBC Sports and Olympics; E.B. Moss, founder of high-profile marketing firm Moss Appeal; and 1977 Oswego graduate Rick Yacobush, market sales manager for Clear Channel in Syracuse. Student reactor was senior broadcasting major Robert Stobie. The 2008 summit, titled Media ®evolution, looked at new media and intellectual property rights on Oct. 22 of that year. Experts participating included J. Scott Dinsdale, executive vice president of digital operations and new technology for SONY/BMG Music Entertainment; Erica Farber, CEO of Radio & Records magazine; 1981 SUNY Oswego graduate Steve Leblang, senior vice president of strategic planning and research for FX Networks; Patrick Stiegman, vice president and executive editor/producer for ESPN.com; and moderatorJack Myers, who heads entertainment publishing company Myers Publishing. New that year was an on-stage student reactor, senior broadcasting major Candace J. Dunkley. 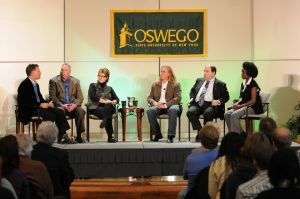 The 2007 edition, October 17 in the Sheldon Hall ballroom, included Paul Condolora (SUNY Oswego ’82), senior vice president and general manager for Cartoon Network New Media; Geraldine B. Laybourne, founder, chair and CEO of Oxygen Media; Doug McMonagle, regional director for Inergize Digital Media; Shelly Palmer, managing director of Advanced Media Ventures Group LLC; and Russell Quy, executive producer of advanced media for TWI Interactive. SUNY Oswego alumnus Al Roker ’76, weatherman and host of NBC’s “Today” show, will serve as moderator. The educational and entertaining day’s programming was based around the theme of “New Technologies + New Generations = The Media of the Future.” At the end of the 2007 event, the summit was renamed in memory of longtime professor Lewis B. O’Donnell in an emotional ceremony featuring O’Donnell’s family, Borrelli, Roker and Oswego President Deborah F. Stanley. The second edition of the summit, on October 20, 2006, looked at “The Impact of Media on U.S. Sports: Who’s Winning? Media, Teams, Athletes or Fans?” Panelists were George Bodenheimer, president of ESPN and ABC Sports and co-chairman of Disney Media Networks; Dr. Myles Brand, president of the National Collegiate Athletic Association; Linda Bruno, commissioner of the Atlantic 10 Conference; Bud Poliquin, sports columnist for the Syracuse Post-Standard and co-host of WHEN’s sports talk radio show; and Stuart Robinson, athletic director at SUNY New Paltz. Linda Cohn, a 1981 SUNY Oswego graduate and an anchor on ESPN’s SportsCenter, served as moderator. The first summit on Oct. 27, 2005, asked “Why Don’t We Trust the Media? How Can the Media Recover Public Trust?” Panelists included Ben Bradlee, legendary editor of the Washington Post during Watergate; Tom Rosenstiel, director of Columbia University’s Project for Excellence in Journalism; Kimberley A. Strassel, a senior editorial page writer for the Wall Street Journal; and David Folkenflik, who covers media for National Public Radio. Moderator was SUNY Oswego alumnus Ken Auletta, a media analyst and best-selling author.